In the middle of the Baltic Sea lies an eastern outpost of Denmark: the rocky island of Bornholm. Here, on the northern tip of the island, we find the largest castle ruin in Northern Europe, the 12th century structure Hammershus. 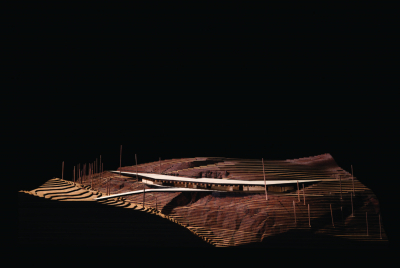 Next to is, nestled in to the landscape, is the new visitor centre, inaugurated in the spring of 2018. 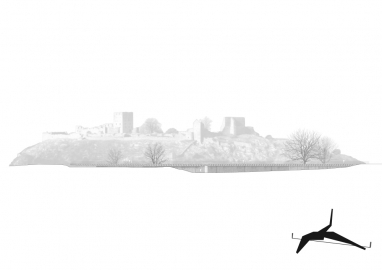 The project is discreetly dug into a west-facing slope opposite the Hammershus castle ruin. Here, nature and building have been working together for centuries. 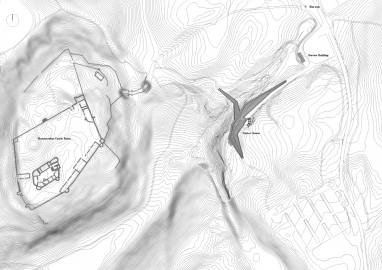 The castle grows out of the rock, 75 metres above sea level, its shape informed by the contours of the terrain. This informs our project. 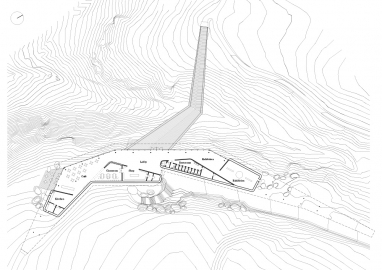 At the edge of a rocky slope we traced the curves of the landscape, translating them into geometries that define the visitor centre’s floor, walls and roof, in a low key architecture that seeks to frame the visual connection with the castle ruin and the landscape. 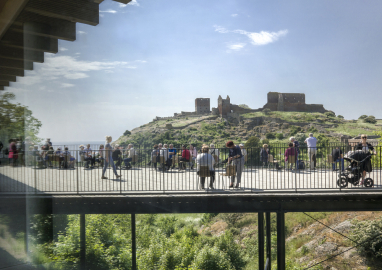 The 1,000 m2-building has a simple programme: half is used for exhibitions about the castle ruin, half contains café, shop, education unit and toilets. 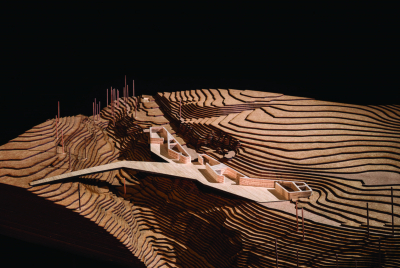 The building is organized with two kinds of spaces:; and, against the slope, a variety of closed spaces that provide back-up and secondary functions, with limited access to the public. 1. 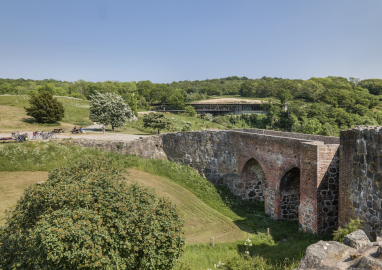 Placing a building in a nature reserve, next to one of the most significant heritage listed buildings in Denmark: we developed a thoughtful and dug-in building which followed the site and provide the necessary orientation towards the castle from all publicly accessible places. We kept the ruin as the main protagonist, while physically linking the old and the new, to create improved visitor access across the site. 2. 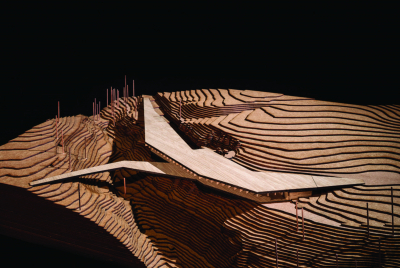 Developing a concept that was adaptable to uncertain economic, political and physical conditions after the competition phase: We made a flexible plan where the concrete backbone of the structure could adapt to changing ground conditions, and the whole plan could scale and adapt to changing needs and economy. This allowed the project to shrink roughly 30% after the competition, while keeping the concept the client had wanted. The building consists of concrete, glass and wood. 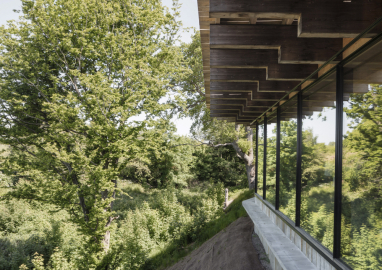 The concrete floor, foundations and walls hold back the excavated cliff and soil, and support a floating roof structure of cross-laminated wood topped with sawn oak on the roof platform and connecting footbridge. 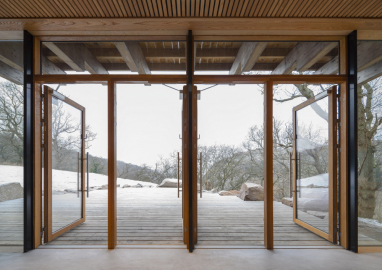 Exterior doors are steel frames with oak casings. Interior doors and partitions are roughly sawn oak planks, and the custom built-in furniture is also wood. These elements supply tactile warmth and functionality to the concrete structure. 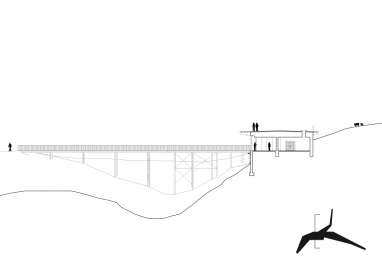 The project continues a Nordic gesamtkunstwerk-tradition. Most of the furniture and fittings, including door handles, lamps, benches, shop and café interiors, is custom-designed. 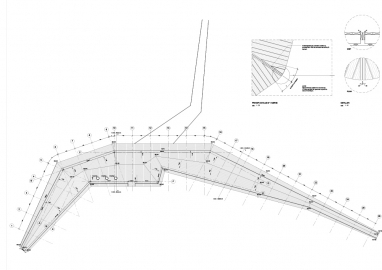 Together with a service building and bus stop, they are conceived as an integral part of the architecture. 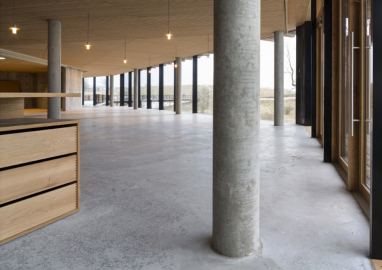 The building complies with the strict sustainability demands of the Danish building code, helped by robust detailing, by the thermal mass of the surrounding slope and by the protruding roof, shielding windows from summer sun, while letting the low winter sun warm the building. All materials and details are selected to be robust and to patinate beautifully, to minimize maintenance.